KEPALA BATAS: Diplomatic relations between Malaysia and Myanmar remain strong despite Kuala Lumpur being vocal against the persecution of the ethnic Rohingyas in the republic. 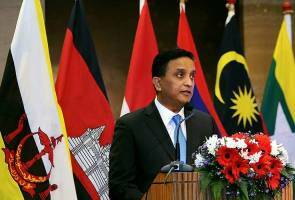 Foreign Deputy Minister Datuk Seri Reezal Merican Naina Merican said business was as usual for the Malaysian Embassy in Yangon and vice-versa. "In this case, as usual, Malaysia will choose a peaceful approach in solving humanitarian crisis, especially involving the ASEAN-member countries. "We're being vocal because of the oppression of the ethnic Rohingyas but at the same time, (we) do not intervene in the internal affairs of the country. Now, it seems that the efforts have shown a positive development," he added. Reezal Merican was speaking to reporters after handing over aid to over 1,000 Northern Seberang Perai fishermen in Penaga here Saturday. Myanmar had recently agreed to participate in a meeting involving ASEAN foreign ministers to discuss the current situation at Rakhine in Myanmar's northern region.